Please register and join the awareness run. It was organized at night so that people with photosensitive porphyrias can participate too. We invite you to the Bent Rods Bass Club for the fundraising tournament. Bent Rods Bass Club strongly believes in giving back and in the Karma of helping others, so each year they pick a new Charity to support. For 2015 they have picked the APF. For fundraising event they will be hosting the Bent "mini" Rods Challenge and raffling off a custom built bait casting rod & reel. Location: Deep Lake, Lake Villa, IL. Jack & Lydia's Resort. Entry Fees: $20 per angler. If you want to help us give back and buy a raffle ticket for the custom rod, contact the treasurer: buster@bentrods.org. We also would like to remind you about the upcoming undertaking from the Cook family. As you may know, the Cook brothers, Cason and Caul, have EPP and have set a great example about enhancing awareness of the disease in their local area. They have been hosting a Hat Day for many years in their home town of Vernon, TX. This year, in addition to a Hat Day, Cason & Caul are hosting The Shadow Race (benefit barrel race) in Vernon, TX in November. They are getting some t-shirts together to sell as well. We appreciate all your support in raising awareness! Porphyrias are a group of rare disorders passed down through families. An important part ofhemoglobin, called heme, is not made properly. Heme is also found in myoglobin, a protein found in certain muscles. Normally, the body makes heme in a multi-step process. Porphyrins are made during several steps of this process. Patients with porphyria are lacking certain enzymes needed for this process. This causes abnormal amounts of porphyrins or related chemicals to build up in the body. Porphyrias are life-long diseases with symptoms that come and go. Some forms of the disease cause more symptoms than others. Getting proper treatment and staying away from triggers can help lengthen the time between attacks. Get medical help as soon as you have signs of an acute attack. Talk to your doctor about your risk for this condition if you have a long history of undiagnosed abdominal pain, muscle and nerve problems, and sensitivity to sunlight. *The second annual Chester M. Jones Lecture, presented in part at the Massachusetts General Hospital, Boston, March 18, 1960. From the Department of Medicine, University of Minnesota Medical School and Hospitals. Aided by the John and Mary Briggs Fund for Porphyria Research, and under a contract with the Research and Development Command, Surgeon General's Office, United States Army. In order to better understand the Porphyrias and how the disorders are inherited, it is helpful to understand some concepts of basic genetics and inheritance patterns. Deoxyribonucleic acid (DNA) is a nucleic acid that contains the instructions used in the development and functioning of all known living organisms and some viruses. DNA is often compared to a set of blueprints or a recipe or a code because it contains the instructions needed to make certain proteins, which are the complex molecules that do most of the work in our bodies. Each of these proteins has a specific function in the cell, and, ultimately in how the organism develops, its physical makeup, and how it functions day-to-day. The DNA segments that carry this genetic information are called genes. The size of each gene varies greatly, and there are about 20,000 genes that are distributed along the 23 pairs of chromosomes. A DNA molecule is a twisted double-strand of building blocks, called nucleotides. It is like a twisted ladder, with the vertical stringers made of phosphates and sugars and the rungs made of pairs of nucleotides. There are four nucleotides in DNA: adenine (A), thymine (T), guanine (G), and cytosine (C). Also important is that on each rung of this ladder, A always pairs with T, and G always pairs with C. These nucleotides along the ladder are like letters in a word, and put together in their specific order make up the words in a detailed set of instructions. These instructions are read using a special code, called the genetic code. Within cells, DNA is organized into long structures called chromosomes. A chromosome is like a cookbook with many recipes (or genes) that tell the body how to function. The human body is made up of trillions of cells and over 200 different cell types like various blood, liver, and brain cell types. Each cell contains 46 chromosomes. Each chromosome can be identified by its relative size and location of the centromere, a constriction in the chromosome. Hello dear members, we have an open letter from Dr. Peter Tishler to share with you. I have established the American Porphyria Foundation Drug Database, for you all to consult for drug safety (or not) when you are prescribed a new medication. I received information from many of you several years ago, and added lots of your information to the Drug Database. I write you now to ask you to report me the names and results of any drugs you have been taking since the beginning of 2013, so that I can compare your report with the Drug Database and hopefully add new information (OK! or BAD!) to the Database. Please complete the attached table and send it to the American Porphyria Foundation at 4900 Woodway Dr. Ste 780, Houston, TX 77056, or copy this table and send it back to us via Email. Many thanks! "Remember.... Research is the key to your cure!" Members often complain of poor sleeping patterns and a feeling of being ‘tired all the time’. Try some of the suggestions below to improve your quality of sleep. 1. Mattresses should be changed at least every 10 years. Quality deteriorates by up to 75%. Make sure you have the right mattress, test prospective beds by lying down in your normal sleeping position. 2. Cut out coffee. Reduce your intake of stimulants, including teas, coffee, cola and other caffeinated drinks, especially in the evening. Stick to milky drinks instead. More than one or two units of alcohol will also impair your quality of sleep. 3. Exercise more. Moderate physical activity lasting 20 minutes or more, three times a week, will help you sleep better and give you more energy. Because exercise is a physical stressor to the body, the brain compensates by increasing deep sleep. Light activity early in the evening is best. 4. Meditate. Use visualization or meditation or relaxing music to help you get off to sleep. 5. Don’t Overheat. 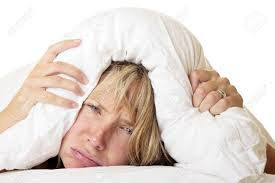 Bedroom temperature should be below 24C (75F) over this would greatly reduce the quality of your sleep. 6. Don’t worry. Try to deal with your problems during the day. Confronting each difficult issue as it occurs should prevent all those niggling troubles from surfacing while you are trying to sleep. 7. Eat right. Certain types of food promote good sleep. Things such as leafy green vegetables, steamed or boiled; whole grains, mushrooms, and fruit. Avoid overly-rich foods just before bedtime. 8. Get up. If you can’t sleep, don’t just lie there, get up and make a hot milky drink, read a book or listen to soothing music until you feel drowsy again. Return to bed when your eyelids start feeling heavy and you start yawning. Remember....Research is the key to your cure!"